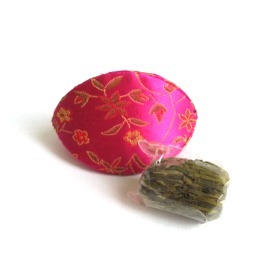 Silk Pouch Blooming Flower Tea Set, the flower tea is kept in a very unique and beautiful shell case made of chinese silk. The shell cases can be used as jewelry boxes or as decorative items. You are welcome to add your personalized gift message to be included in the shell case that comes with our Silk Pouch Blooming Flower Tea Set.